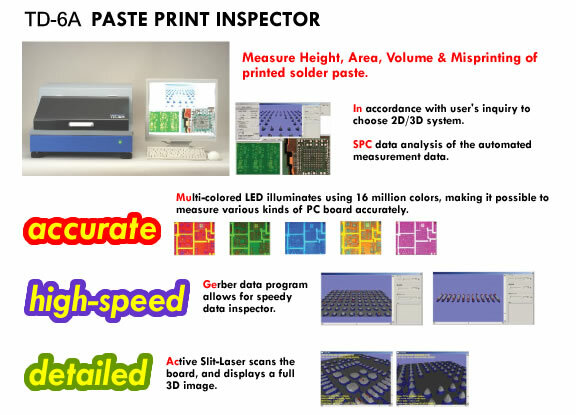 TD-6A Paste Print Inspector - Measure height, area, volume, misprinting of printed solder paste. In accordance with user's inquiry to choose 2D/3D system. SPC data analysis of the automated measurement data. Multi-colored LED illuminates using 16 million colors, making it possible to measure various kinds of PC board accurrately. Gerber data program allows for speedy data inspector. Active Slit-Laser scans the board, and displays a full 3D image. Accurate, high-speed, detailed.